Timmy was 4 months old on Tuesday. He'll have his wellness visit this Monday coming up, but he's about 16 lbs right now. As I mentioned in my last post, Mr. Personality (aka Mr. Handsome) was being super goofy the other night and very much enjoying having his picture taken. Over the last month Timmy has hit so many new milestones and brought many changes to our happy little schedule. At about 14 weeks, he laughed for the first time and when laying on his back stuck his legs up in the air at a 90 degree angle. Then came the changes. My little guy went from waking up just once or even sleeping through the night to being back up every 2-3 hours and was super cranky every night from around 4-7. He also stopped throwing up quite so much. I've been eager to get him off the reflux wedge since he's almost outgrown it and last week figured well, if he's not sleeping anyway, may as well transition him now. 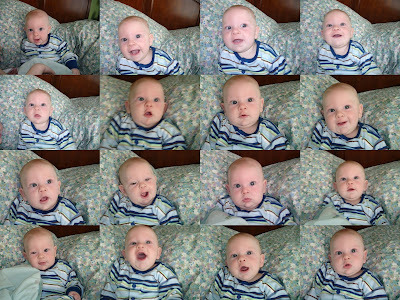 So at about 16 weeks, he moved into in crib in his own room. After just one week in his crib he has rolled from back to side AND belly to side - still hasn't flipped all the way though. He's also spinning so his head ends up where his feet started out. In the same week, he mastered his head control. And right on his 4 month birthday he grabbed his toes when laying on his back and has begun to love playing with his own hands. So, now I'm thinking the sleep interuptions may be due to all these new things he was getting ready to do. He's still waking now, but after his big sleep from 7-12ish he seems to have toned it down to waking every 3 1/2 hours. Unfortunately, he still won't sleep longer than 30 min on his back so I have caved and am letting him sleep on his belly. I am a nervous reck about it as it relates to SIDS, but I know it's the only way he's going to get any sleep. He has slept on his belly since he was a few weeks old on the wedge and he has complete head control. He's also very close to rolling over, but I will feel much better about it when he IS rolling over. He has really been enjoying his toys - anything he can hold on to and get in his mouth and he is really happy to play in his exersaucer (for a little bit at a time, anyway). LOL about the last part of your post. Thanks for the giggles. OMGosh! Timmy is so BIG and cute! LOVE his HUGE eyes!!!! I can't believe how tall he looks in that exersaucer! How's Thursday look for you??? yes julie you are right, as usual. i do love katie telling you you are wrong. get used to it . the story made me laugh. it brought back memories. but remember how much you love me now! he has changed soooooo much since i last saw him. i cant wait to see all of you again soon. now u just have to try and get a video of him being silly so that i can feel like im there! Wow! Timmy is getting so big. And not to mention handsomer everyday. I can't believe you can get him in that exerscauser. Andrew used to love his but I don't think I could have gotten him in one that quick. Andrew had an exerscaucer just like that one and he used to hit his head on the corner of the castle. eek. I eventually had to take it off. Hope to hear from you soon. Have a great weekend. PS...Breelyn was rolling up on her side when I first brought her home and she has picked her head up ever since I brought her home. She is an amazing kid. I didn't think that was possible.